Attachments in Cold Email: Should We Ever Use Them? You are here: Home / Blog / Uncategorized / Attachments in Cold Emails: Should We Ever Use Them? Do attachments in cold emails make your message more or less effective? Most people who run cold email campaigns struggle with this question. 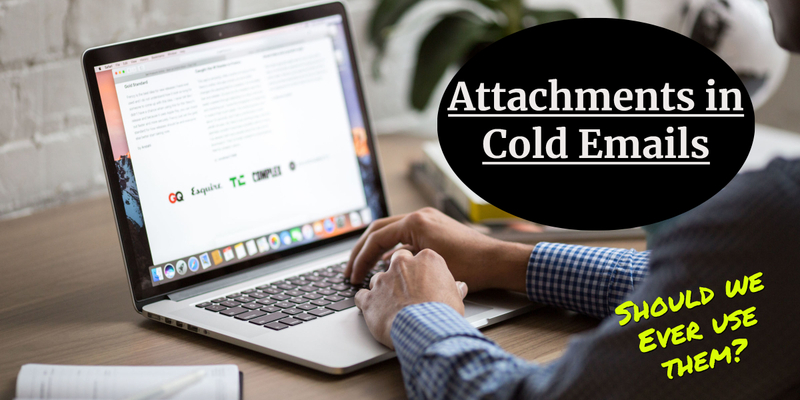 On the one hand, cold email attachments helps you share more information about your product, service, or brand with the prospect. But, on the other, it may be stopping prospects from opening and reading your emails. Obviously, they can’t respond to something they’ve not read. A recent survey of popular online lead generation tactics shows that email outreach is the most effective tool available. But to tap into those sweet, sweet sales, you must first start by writing great cold emails. Simply put, your email must effectively convert prospects into loyal customers. That seems like a stretch, right? But it is possible, if you can get prospects to open and read your cold emails. Research shows that a typical cold email campaign has open rates of between 15% and 30%. So if yours generates open rates of less than 15%, chances are you’re doing something wrong. How do Anti-Spam Filters Treat Emails with Attachments? Over the years, many marketers and salespeople got in the habit of sending cold emails with attachments. And the need to do this is completely understandable. After all, much of the outreach advice available today says that you should keep your cold emails as short as possible. From a sales perspective, this rule can be a little inconvenient. Because of it, there really isn’t much space left to get into all the details about what you’re marketing. So there’s a huge temptation to use attachments in cold emails to share your company profile, brochures, and every other marketing material that shows all the features and benefits of your product or service. The big draw of this approach is that it allows you to reach out to potential clients all in one go. The assumption is that if the prospect is interested and wants more information, they can simply open the attached files to find it. And because of this additional information, they’ll be so swayed that they will reply. But some would argue that this is not how cold email campaigns are supposed to go. To understand why, you have to look at it from the prospect’s perspective. Sending cold email attachments can make life much easier for you as the marketer or salesperson, but what do your prospects really think of this? So put yourself in the prospect’s shoes. Let’s say you receive an email from a complete stranger. In the message, they give you a vague pitch about some service or product that you’ve never heard of. Then they ask you to find more details in a mystery file that they’ve attached to their cold email. Are you comfortable enough to download and open an attachment from a total stranger? What if the attachment contains some virus or malware that’s going to corrupt your computer? Even if you could get past that fear, do you have the time or desire to download the attached file and open it? And lastly, how many times have you opened a cold email attachment? For cold email prospects to take the time to download, open, and analyze any attachment, they would have to really care about you or your product first. And you simply haven’t built up enough trust by the time of that initial email. It might feel like an awesome attachments in cold emails might make them care more about your service or product, but that’s just not how it works. Then, you have to keep in mind that spammers are known for sending short emails that have attachments. You know that you’re not a spammer, but the prospect doesn’t. They will need all the proof you can give them to be sure that you’re not a spammer, and sending such a poor cold email isn’t the way to do it. Keep in mind that if your cold email makes them hesitate for any reason, chances are high that you’ll lose them and never get a reply from the prospect. This is especially true if you consider the hundreds of emails that are sent to the average business executive on any day. With this approach, the potential client will simply send your message straight to the trash or spam folder. Another thing to think about is that prospects just don’t want to know everything about your product or service in one cold email. Whether you send them a wall of text or attach an innovative infographic, they simply don’t have the capacity to process all that information in one go. Remember, the primary goal of any cold email is to get a reply. It isn’t to make the prospect read a lengthy email, click through to your website, or buy stuff from you. Instead, your focus should be on building a mutually beneficial relationship with potential clients. That’s the only way to consistently drive up your sales in the long run. When it comes to cold email campaigns, attachments in cold emails can make you look less trustworthy and reliable. It can also cause you some serious problems with deliverability. Apart from that, adding the “please find attached” statement to your message can make your call to action less effective. You don’t want to distract potential clients with too many attachments or instructions. Instead, the best move is to ask for further opportunities to communicate, whether that will be through another email, a phone call, or face-to-face meeting. As you can see, there are many more disadvantages than benefits to using cold email attachments. But to drive the point home, it is important to understand how anti-spam filters deal with such messages. As we’ve already pointed out, spammers used to send out mass emails that contained very little text and lots of attachments. Because of this, many email providers now treat such messages as spam. Then there is also the question of the size of message that a prospect can actually receive in their inbox. Again, this varies from one email provider to another. In general, tacking on attachments to your cold email messages will put their deliverability at risk. Simply put, this approach could make your emails much more sensitive to anti-spam filters and not even get to the prospect. It could also affect your domain reputation negatively, which will harm your outreach efforts in the long run. So, what is the bottom line? Make it standard practice to stay away from cold email attachments. But it is also important to note that it would be impossible to say with 100% certainty whether your cold email messages will trigger an anti-spam filter. This is because each filter has its own set of standards that it follows. Using too many exclamation points!!! Last but not least, check your cold email messages with Sender Score before sending them out. Most email servers look up an email’s score before deciding what to do with it. If your score is too low, then your messages will be sent straight to spam. Even knowing all this, you might still feel the need to add some type of content to your cold email. This may be because that extra information is crucial to getting replies from your prospects. Put the files and documents that you want to attach on your server. Then, you can simply share a link to this material in your cold email. This method does away with the need for the prospect to find attachments and open or download them on their own drives. Instead, they could simply click on the link and access the information easily online. If you don’t want to put it on your own server for any reason, then there are many other options for you out there. These include Google Drive and Dropbox. It’s also important to take the file’s format into consideration and share it via the right platform. For video attachments, the best option is YouTube. For audio files, YouTube can also work well, but platforms like iTunes and SoundCloud could be better. But your attachments don’t have to be typical documents or files. You could also create a separate, dedicated landing page on your website. Such a page will be filled with additional information that could be interesting to potential clients. But make sure that this information is customized to appeal most to your target group. This is an especially great idea because it lets you track more statistics than just open, response, and click-through rates. You can measure and analyze prospects’ behavior while they are on the landing page using tools like Google Analytics. The resulting data will show you what you need to do to best appeal to your target prospects. But if all else fails, why don’t you try asking the prospect first? If you have to send attachments in cold emails, ask for their permission to send more information first. To pull this off, you first have to intrigue the prospect with your email and end it with a powerful call to action. Here, you can ask them if they would like a report, ebook, or video with more details on the subject. This way, you actually make it easier for the prospect to respond to your cold email. This will drive up your reply rate in the long run. Plus, it also gives you the chance to identify which prospect might actually be interested in what you’re selling. When it comes to using links, there are some crucial ground rules to follow. This is to ensure that your links actually add value to the cold email. They also keep you from running into the same problems you do when using attachments. If you add too many links in one email, the prospect won’t be able to understand what you want them to do. Which link should they click on? Which one will give them the most detailed information about your product or service? Use too many links and your email will quickly turn into a complete mess. Instead, put in a link that leads the prospect to a place where they can take the next step. This could be to contact you, find more information about your product or service, or know more about your company. This may sound a bit obvious, but you would be surprised at how often people send cold emails that contain broken links. Something as simple as removing the last letter from a link address is more common than you would think. So, do a double check before sending your email to ensure the link works. Otherwise, links that don’t work may affect your credibility negatively. It’s important to ensure that prospects can check up on you easily. Putting the link to your website in your email signature is not an aggressive sales tactic – just common courtesy. These days, it’s not enough to just write a great pitch and put in a link to your website. Unfortunately, this won’t win you any new customers automatically. Remember, cold emailing is not about selling. Instead, it’s about starting a meaningful business relationship which may (or may not) lead to a sale. So if you give prospects a link to your site, don’t expect to just sit back and rack up the sales! You’re only exempt from these rules if your email only contains “transactional” or “relationship” content. But even in that case, you should still avoid giving out any information that is false or misleading. “Permission marketing” is an amazing marketing concept that places all the power on the prospect. They can choose whether or not they want to be part of your cold email campaign. In terms of cold email, this rule implies that you have to get the permission of potential and existing customers in order to email them. A great way to achieve this practically is by getting them to subscribe to your mailing list or newsletter. If your email server has been placed on any backlists, then it becomes really had for you to run any outreach campaigns. For example, you will likely be unable to reach any new prospects or reliably send email to older ones. The best way to get off a blacklist is by following up with the website that added you there. It might be a lengthy process, but it will boost your long-term cold email outreach prospects. Simply put, a spam trap is any email address that is no longer active. ISPs flag these addresses, and consider them as no longer used by humans. So if it consistently receives new messages, email servers could decide to turn them into a spam trap. Essentially, the address keeps receiving messages and marks these senders as spam. So, your best move is to avoid these kind of addresses at all costs. To do this, go through your mailing lists regularly to ensure that you’re reaching out to active email addresses. Then, simply weed out the rest. This process may seem a bit intimidating, but it is very necessary to your cold emailing success. To make it easier on yourself, you could just turn to an email lookup service like RooJet. RooJet helps you find all current email addresses on any domain. This ensures that you’re consistently generating leads. It also helps automate your follow up efforts. But, most importantly, it offers up-to-date analysis of your whole campaign. This is a great way to ensure that you keep your bounce rate low, helping you avoid the spam traps. When it comes to cold email campaigns, it is important to do all you can to ensure your messages actually reach prospects. And when they do, it is also important to avoid alienating email recipients. When a prospective customer gets annoyed, the first thing they will do is click on “mark as spam” – and you should do your best to avoid that. These tips and best practices will help you do this. It’s also important to send cold emails without attachments. Not only do attachments in cold emails make your message heavier, they also alert anti-spam filters. With an attachment, your prospect just won’t see your email – because it will go straight to the spam folder. Instead, focus on making your cold email all about building relationships and getting replies. Don’t use attachments in cold emails to flood the prospect with too much information at once. Intrigue them and get them to reply! And once you capture their attention, you will get multiple chances to share with them all the data you want. How to Write a Sales Pitch Email Example What Should You Do When You Get an Interested Reply to Your Cold Email?